PC gamers can soon hookshoot their way into the vehicles (and faces) of other players. As much as I enjoy single-player sandbox games, there's something to be said for taking on massive worlds with friends. Sure, having multiple players in solo environments can break gameplay, but you also might have an absolute blast along the way. At least that's the impression I get from the Just Cause 2 Multiplayer PC mod, which allows hundreds of players to team-up, or kill each other, at any given moment. The mod isn't quite ready for its final release, but developers are hoping PC gamers can put it through the paces this weekend. Starting Saturday morning, anyone with a copy of Just Cause 2 on Steam and an internet connection can join the mod's 48 hour beta test, and enjoy all the chaos that will inevitably ensue. Just Cause 2 Multiplayer's beta begins at about 4:00 AM EST, at which point the client will be made available for download. Unlike previous versions of the beta, this weekend's release introduces a Steam authentication system to ensure non-pirated copies of the game are being used. All you need is a copy of Just Cause 2, currently priced at $15, and a registration with the mod's website to access the client. 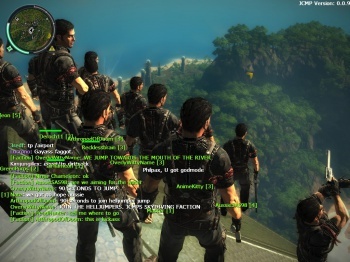 Just Cause 2 Multiplayer only supports a single server at present, but its creators plan to include third-party server support with the official release. Private servers would definitely be a great feature, the only downside being that server populations might not be quite as jam-packed as this weekend. In other words, Saturday is one of your best chances to try and hookshot airplanes alongside hundreds of other players, game-breaking mechanics be damned.